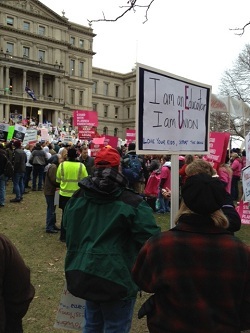 LANSING — A speaker at a union protest against right-to-work legislation said if Gov. Rick Snyder signed the bill he would get "no rest" and that protesters would be at his "daughter's soccer game." (Video below). The Rev. Charles Williams II made the comments Tuesday to loud cheers before a group of thousands of union workers. After his promises to harass Gov. Snyder, he introduced Rep. Richard Hammel, D-Mt. Morris Township, and House Minority Leader Tim Greimel, D-Auburn Hills. Williams is a Detroit-area pastor and left-wing activist. Gov. Snyder later that day signed a bill into law making Michigan a right-to-work state. One of his daughters is a 16-year-old high school student. "Just know one thing, Rick Snyder: You sign that bill, you won't get no rest," Williams said. "We'll meet you on Geddes Road. We'll be at your daughter's soccer game. We'll visit you at your church. We'll be at your office. "Because Michigan workers will not take it laying down — by any means necessary!" he said. Geddes Road is where the Snyder residence is located. After Williams' introduction, both representatives gave short speeches. It appears that union protesters would have little luck finding the governor at the soccer field. According to a player profile on AnnArbor.com, his daughter participates only in softball and volleyball. Editor's Note: A previous version of this article said Rep. Greimel ending his speech "by leading the crowd in a chant of, 'No Justice, No Peace!' " It was actually Rev. Williams who lead the chant.